The ocelot is the best-known small cat of the Americas, largely for the beauty of its spotted coat. Ocelots are found in every country south of the United States except Chile, and a small population persists in South Texas. With the cessation of trapping for the fur trade, habitat loss is the major threat to ocelots today. Although they may be found in an incredible number of different habitats, including those that are disturbed or near human habitation, their long gestation and low litter size makes for a slow recovery from population decline. 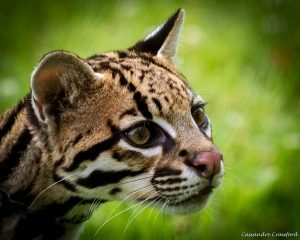 The ocelot is one of the five small cat species with which the Zoo’s Center for Conservation and Research of Endangered Wildlife (CREW) works on its Small Cat Signature Project. In addition to conducting zoo-based research on the reproductive biology of the ocelot, the Zoo also contributes to the study and protection of the endangered Texas ocelot. In the United States, ocelots once roamed throughout Texas and into Arkansas and Louisiana. Today, fewer than 80 wild ocelots remain in the country, deep in South Texas. One of two known Texas populations survives on the Laguna Atascosa National Wildlife Refuge (LANWR). Since 1997, Friends of LANWR and the U.S. Fish and Wildlife Service (USFWS) have held an annual Ocelot Conservation Festival to encourage the local community to help protect ocelots. Since 2007, the Zoo’s Cat Ambassador Program has travelled to Texas with Sihil, an ocelot ambassador, to participate in the festival each year. Nothing impacts the audience more than seeing a real live ocelot. 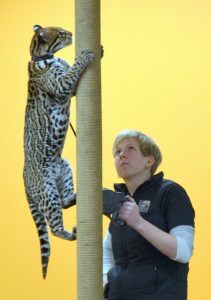 This is often the first time residents have experienced a live ocelot. In addition, Zoo staff members, Dr. Bill Swanson and Shasta Bray, serve as the Ocelot Species Survival Plan (SSP) Coordinator and the Ocelot SSP Education Advisor, respectively, to support the work of the USFWS and its partners to protect ocelots in South Texas. USFWS monitors the ocelot population and protects and restores thorn scrub habitat. They also work with the Texas Department of Transportation to install under-road wildlife crossings to help keep ocelots off the roads as vehicles pose the greatest immediate threat to Texas ocelots. In the future, USFWS plans to translocate ocelots within Texas and from Mexico to bring much needed genetic diversity to the small population. Road Trip with Sihil the Ocelot!